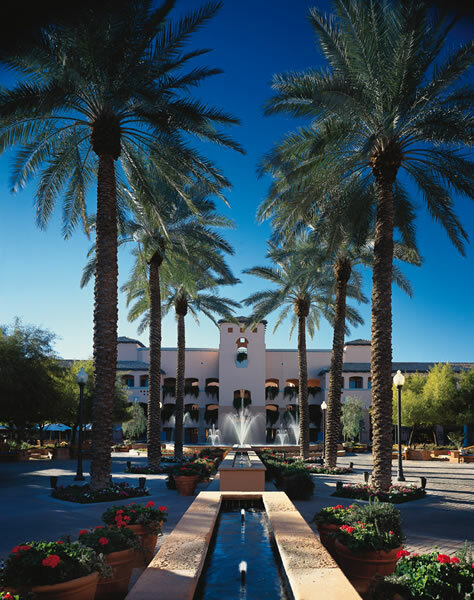 The AAA Five-Diamond Fairmont Scottsdale Princess Resort & Spa has come to reflect the dynamic environment that surrounds it, where sun-washed stone and bright green cottonwoods rise up to meet the pale-blue sky and majestic purple mountains. A member of the "Leading Hotels of the World," this magnificent Arizona golf resort is scenically set against the backdrop of Arizona's McDowell Mountains and pays tribute to Arizona's Spanish Colonial heritage. Boasting one of the best spas in North America (by Condé Nast Traveler), three award-winning restaurants, state-of-the-art meeting facilities, and two 18-hole championship golf courses (including TPC Scottsdale, home to the Annual PGA Tour FBR Open), the Fairmont Scottsdale Princess Resort & Spa is truly an experience like no other. This Arizona golf resort offers five restaurants, spa, salon, fitness center, championship golf and five gift shops.